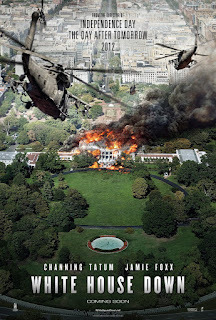 Reparto: Channing Tatum, Jamie Foxx, Maggie Gyllenhaal, James Woods, Richard Jenkins, Rachelle Lefevre, Joey King, Lance Reddick, Garcelle Beauvais, Jason Clarke, Jake Weber, Simon Northwood, Matt Craven, Kevin Rankin, Michael Murphy. Producción: Roland Emmerich, Brad Fischer, Larry J. Franco, Laeta Kalogridis, Harald Kloser y James Vanderbilt. Productoras: Centropolis Entertainment, Iron Horse Entertainment y Mythology Entertainment.